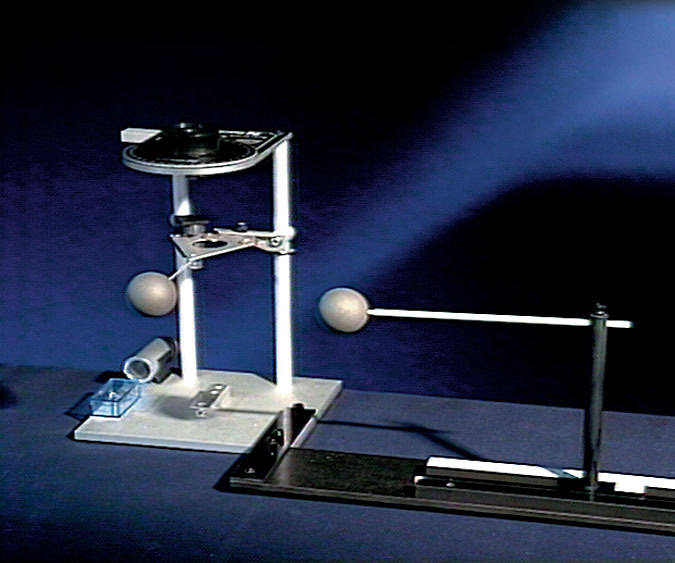 Physics Demonstrations in Electricity & Magnetism is a three-part video program which presents a full range of demonstrations in the areas of electricity and magnetism. Coulomb’s Law quantitatively demonstrated by precision torsion balance. The relationship between temperature and electrical resistance is demonstrated by immersing a wire coil in liquid nitrogen. Separation of charge by the Kelvin Water Dropper apparatus results in this 60,000 volt electrical discharge. Levitation of small magnet caused by current loops on a superconductive ceramic disk. Physics Demonstrations in Electricity & Magnetism is a three-part video program which presents a full range of demonstrations in the areas of electricity and magnetism. The program was developed in an effort to give physics teachers a comprehensive collection of video demonstrations, supplementing the instructor’s live classroom demonstrations. Three-dimensional computer animation is used to augment many of the demonstrations, providing a graphical representation of the physical behavior. Individual demonstrations are 3 to 4 minutes in length and can be quickly accessed using the program's on-screen indexing system. The indexing system allows the teacher to select a particular demonstration and show it at the appropriate time during a unit on electricity & magnetism. The accompanying teacher’s guide gives additional data, information, and suggestions on using the demonstrations to promote further classroom discussion.